It’s a bit surprise to me. First of all, I like the integrated approach where you can find all the information related to vSphere 5.0: from user manual to SDK/CLIs, and even links to communities/blogs. Also, you have nice features like bookmark, search and printing, etc. At the same time, I found it’s a bit overloaded if I am only interested in the API reference, which I am most of the time. I tried to load the API reference into a separate window or tab, but with no luck. If you know of any trick here, please share it in the comment. Luckily the API reference is still included in the SDK package. I extracted it out and uploaded it to the open source VI Java API project home. Now if you like simple docs as I do, you can bookmark it here: http://vijava.sourceforge.net/vSphereAPIDoc/ver5/ReferenceGuide/. The link is also available at VI Java API project home with all the previous versions. Maybe I’m missing what you want to do, but wouldn’t the collapse index button which says “hide contents” on the top right of the main panel do what you are after? In addition, the page you are linking to also has an “old html interface” link which has the same content as what you are now hosting on sourceforge. Yes. The Hide contents button hides the left side navigation tree. 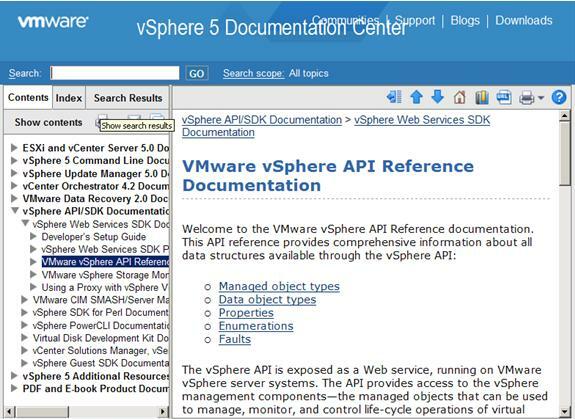 I want to have a vSphere API Reference only left side tree. Thanks for the “old html interface” link. I just tried it and found it’s pretty good. But if I search for “VirtualMachine,” it actually shows me results from PowerCLI too. So it’s as clean as the old way. I know I can limit the scope, but it doesn’t seem to work well. Overall it’s not a big deal but consistent with old style of API doc online. This interface is so much nicer than the VMware one.